The promoters of prosperity theology teach that Jesus was rich. Doesn’t 2 Cor 8:9 say as much? Phil Pringle re-worded the verse to say, “Jesus became poor regarding the wealth of this world on the cross, that those who receive Him may become rich with the wealth of this world.” [Phil Pringle, Dead for Nothing? : What the Cross Has Done for You (Tulsa, OK: Harrison House, 2007), 58]. Ken Copeland in his Believer’s Voice of Victory magazine, Oct 2018 issue, listed his reasons. Creflo Dollar and Jerry Savelle add that Jesus wore expensive clothing as noted by the Roman guards at Jesus’ crucifixion. This teaching allows the prosperity teachers to vindicate their affluent lifestyles as blessings from God. But to do so, they twist scriptural teaching. First, they take 2 Cor 8:9 out of context to assure their “partners” that if they give to their ministries, God will reward them financially. Paul wrote to the church at Corinth telling them of the Macedonians who despite their poverty gave to the collection for the saints as they were able (2 Cor 8:2). Apparently, God did not bless the Macedonians for their generosity because they remained poor. Neither did God deliver the saints in Jerusalem from the curse of poverty. Far from assuring the Corinthians of financial blessing, Paul says the saints in Judea may one-day be helping them (2 Cor 8:14). My replies to the arguments for Jesus being wealthy are as follows. Joseph was a carpenter, not a wealth businessman. When Jesus’ parents brought him to the temple for Mary’s purification, they could only afford “a pair of turtledoves or two young pigeons”, the offering of the poor (Luke 2:24). The gifts from the wise men would have been useful in funding his family’s escape to Egypt but would have been spent long before Jesus started a public ministry. Having a treasurer does not mean that an organisation has abundant wealth. I am the treasurer of a small charity which needs to manage its meagre funds carefully. Besides, Scripture does not call Judas a treasurer but the keeper of the common purse which he stole from (John 12:6; 13:29). As Paul said, the poverty-stricken Macedonians followed Jesus’ example and gave generously to the poor as they were able. Jesus’ disciples knew he gave to the poor (John 13:29). But, you do not need to be rich to give to the poor. Jesus’ seamless robe worn to the Passover, arrest and crucifixion does not mean he was rich. It was probably given to him by his supporters since he claimed not to wear fine clothing (Luke 7:25). It is only noteworthy because the soldiers cast lots for the garment in fulfilment of prophecy. Although Jesus at one stage lived in a house at Capernaum (Mark 2:1), later he said, “Foxes have holes, and birds of the air have nests; but the Son of Man has nowhere to lay his head.” Matt 8:20b. He probably was neither rich nor poor. So, if Jesus was not rich what does 2 Cor 8:9 mean? 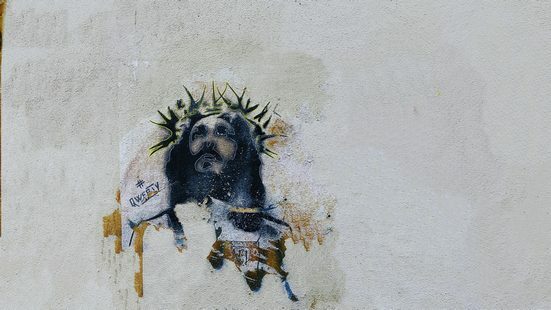 Christ becoming poor refers primarily to the incarnation (see Phil 2:7; John 17:5), not to the circumstances of Jesus’ life or his crucifixion which follow from the Son of God’s gracious act of taking on human form. Jesus’ wealth on earth is not the point. Paul refers to the riches of Jesus’ followers as their salvation in Christ. Paul urged them to give of whatever wealth they have in service of righteousness: “He who supplies seed to the sower and bread for food will supply and multiply your seed for sowing and increase the harvest of your righteousness.” (2 Cor 9:10). The Macedonians were eager to give out of their poverty because of their joy at receiving the mercy of Christ. Likewise, God would bless the Corinthians in their giving. Worldly wealth in God’s Kingdom is a means to the greater end of loving and serving others. Amassing wealth can only be vindicated by spending it in delivering justice for the poor (Prov 16:8). Giving to the poor does not mean you are not poor yourself. But for the rich to part with their money is, for many, too difficult (Matt 10:22).